The Bears might end up with at least one more flex down the stretch, too. The inclusion of flex scheduling has been perhaps an underrated boon to viewers, with no better example than today’s news that the country won’t have to watch the 49ers and Raiders play Sunday Night Football games back-to-back. The league announced that the Week 13 Seahawks-49ers game has been replaced by Steelers-Chargers, while the Week 14 Steelers-Raiders matchup has been bumped for Bears-Rams. Both of these moves make sense, of course; Week 13 is, well, weak overall, but both Pittsburgh and the Chargers are battling for playoff spots, and the 49ers are very much not doing that. But it’s the Week 14 matchup that provides the biggest disparity; Jon Gruden’s Raiders are a disaster right now, and while there’s certainly some curiosity to watching a franchise fall apart on a grand stage, Bears-Rams is a game not only between two of the leagues top markets, but between two of the league’s most entertaining teams. The Rams are in year two of their post-Jeff Fisher renaissance, and at 9-1 they look every bit a Super Bowl contender. The Bears, meanwhile, are one of the more interesting stories of the league this year, and they’ve already been flexed once, for this weekend’s pivotal NFC North game against the Vikings. In many ways they mirror the Rams success turnaround, going from a mediocre, generation-behind coach to a younger, offensive-minded one to help unlock the potential of a young quarterback. That’s not to say that Matt Nagy is Sean McVay, or Mitchell Trubisky is going to continue to play fairly high-level football (albeit with some understandable growing pains tossed in), but that’s what’s happened so far this season. 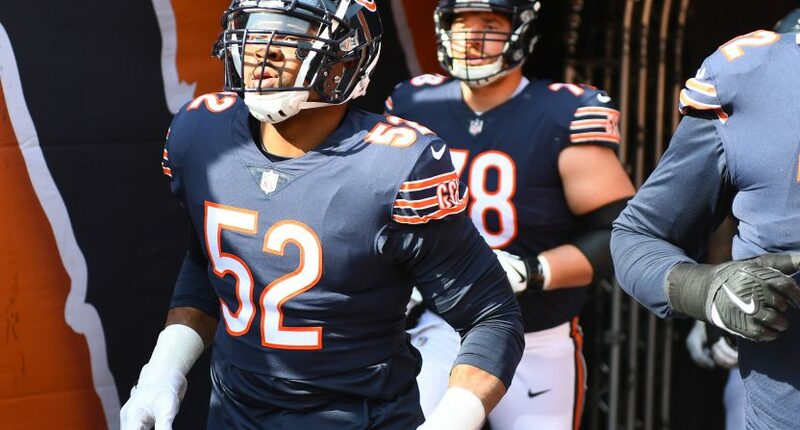 The Bears defense, meanwhile, is for real; if they can stay mostly healthy (and especially if Khalil Mack continues to recover from an ankle injury) watching them try to slow down the Rams at Soldier Field in December is a very enticing prospect, much moreso than watching the Steelers sit on the Raiders for three hours. It’s a bit surprising the Bears-Rams game wasn’t slated for Sunday Night Football from the start of the year, although it’s easy to forget now just how bad Chicago has been for a years. It’s actually comforting in a way that the league didn’t just throw it up there for ratings purposes, and now we’re going to get a game that should, theoretically, be good both for fans and for NBC. The Bears originally had just two primetime games on the schedule, their opening night collapse against Green Bay and their Week 2 Monday Night Football win over Seattle. Now, though, with this weekend’s flex game, the Thanksgiving Day game at Detroit, and the Rams contest, they’ll be in a national slot for three out of four weeks, and it’s not impossible they get flexed once more before the end of the year. That’s a sign the system is working. The NFL is so difficult to project year-to-year for a variety of reasons (injuries, sample size, roster and coaching turnover, and more), and flex scheduling is a nice way around that problem. Football fans only get so many weeks a year, and when the national slots are clogged with bad teams it can be brutal, and that’s the last thing the NFL should want as the playoff race heats up.